We have an active Patient Participation Group (PPG)made up of volunteers from all walks of life. The group meets with the doctors and representatives of the nursing and reception staff every few months. At these meetings we discuss a host of issues and try to ensure that services are shaped towards patients. A recent notable success was achieved when Chesterfield Royal Hospital changed the wording of their standard appointment letter to make it easier for patients to understand. 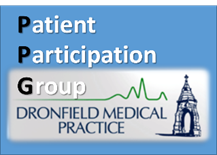 What is a Patient Participation Group (PPG)? PPG’s are the coordinated voice of a practice’s patients. The practice consults with and listens to the views of the PPG in the development of the service it provides. The PPG also offers a platform through which patients can influence the way the NHS both develops and delivers services more widely. The PPG has an attending volunteer membership of up to 20 members and an unlimited eMembership (those who contribute via eMail). To see our Terms of Reference, click here. Who can join and how to apply? Any adult patient registered with the Dronfield Health Centre Practice qualifies for membership. All qualifying applications will be accepted for eMembership, those wishing to be attending members, limited to 20, will be subject to there being a vacancy. Priority will be given to those under 50 and parents or carers of younger children who are currently under represented. To apply or find out more, please eMail your details to dhcppg@gmail.com or pass them to the Practice Manager. What are the PPG working on currently? Developing our PPG web presence and use of social media. Do you have something you want share with the PPG membership that might improve the practices’ services? Ideally please do join us as a member, but if you feel unable to, then drop us an eMaildhcppg@gmail.com and it will be considered by some of the members and appropriate actions taken which may include taking the matter up with the practice. Please note that complaints or compliments regarding the practice should in the first instance be directed to the Practice Manager.